Lake O’Hara camping requires advanced planning, but you will be rewarded by the memories of one of the Canadian Rockies’ most beautiful campgrounds. 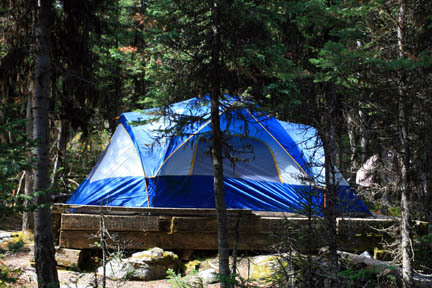 Lake O’Hara Campground has no public road access, meaning it is for tent campers only. Even though access to the Lake O’Hara Campground is aboard a bus, you should treat the trip as one into the backcountry; passengers are limited to one large or two small bags per person. No hard-sided coolers, fold-up chairs, and musical instruments are permitted at the campground. No large campstoves are permitted, instead, you should bring a smaller backcountry-style burner. Some people cook hotdogs over the communal campfire, but this source of heat is not suitable for any other type of cooking (except marshmallows). The 30 individual campsites are forested, and each has a tent pad (we find the sites farthest into the forest are least affected by smoke from the main firepit). 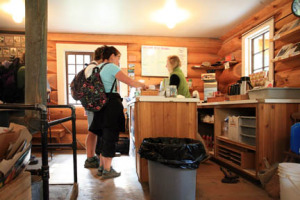 All other facilities are communal, including a few large picnic tables, pit toilets, two smaller kitchen shelters with woodstoves, a covered dishwashing station, bear-proof food caches (one is designated for each site), and a large firepit where campers congregate each evening. The atmosphere among campers is extremely convivial – almost without exception all are keen hikers and many are “experts,” making the pilgrimage to Lake O’Hara an annual tradition. Camping is $10 per person per night, the bus costs $15 per person round-trip, and the reservation fee is $12 per booking. spot for themselves. Reservations are limited, so there will always be enough sites for everyone. Those arriving on the morning buses will simply have more choices. If you’ve forgotten anything, there are often extra sleeping bags and stoves at the campground, but don’t rely on them to be there. A short walk from the campground is Le Relais Day Shelter, which is operated by the Lake O’Hara Trails Club. Open daily 8:30 am to 6:30 pm, here you’ll find hot and cold drinks, snacks, sandwiches, ice cream, and muffins for sale at reasonable prices (cash only). Reservations are not taken for outbound buses, so you can jump aboard whichever bus suits your schedule. If you decide to leave on an afternoon bus, you are required to pack up your tent and place it and all your gear in the main storage shed. Unlike other backcountry campgrounds, you do not need to pack out your trash, as a bear-proof shed is used as a trash can.